Sam | A Savings WOW! 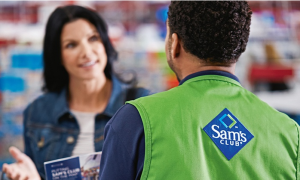 Have you been thinking about getting a Sam’s Club membership but haven’t done so yet? You’re in luck! With the membership deal available at Sam’s Club right now, you will actually have a moneymaker! – Purchase the Sam’s Club Groupon for $45. – PLUS, if you would like an additional 5% in Shop Your Way points back, purchase your Groupon through your Shop Your Way Rewards account. Don’t forget to sign up to have me as your personal shopper while you are on Shop Your Way! Come back and let us know what you end up buying at Sam’s Club!